It isn't easy taking care of a dog, much less two, which is what I have! So this month, I am participating in the Apartment Guide's “Pet-Friendly Tricks: Keeping Your Pet-Friendly Space Stylish” blogger program to bring you a few tips about living with pets. When I first moved to New York several years back now, I didn't have either of my two fur babies. It was hard enough to find an apartment back then, now even much more so. I definitely could have used a few tips from a post or two so I really hope this helps you out. If you're already in a place and are planning to move, check out Apartment Guide's helpful suggestions for moving to and exploring a new neighborhood with your pet. Whether you’re living, looking or moving, Apartment Guide will help point you in the right direction. Living in an apartment in New York is difficult. The spaces are small and there are many restrictions. Some buildings are dog friendly, while others not so much. I had a friend who got kicked out of their apartment because they got a dog. They're partially at fault for not finding out the policies first. However, you should also be cautious even if you see dogs in the building because new policies may have come in since then as in my building. We have a ton of dogs in the building but shortly after we moved in, new tenants were no longer allowed to have dogs. Granted, people still did and they're lucky our landlord has turned a blind eye to it all. This serves as a reminder you should always check your apartment's policies when you consider getting a new furry family member. 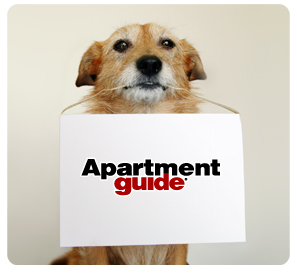 If you’re ready for a whole new space or looking to move with your pet, Apartment Guide has the photos, floor plans, features and tips to help you search for the perfect pet-friendly apartment community. Once you've figured out whether or not your apartment allows dogs, what kind of dog do you want? Things you may want to consider include indoor and outdoor space, your schedule, you family structure amongst others. 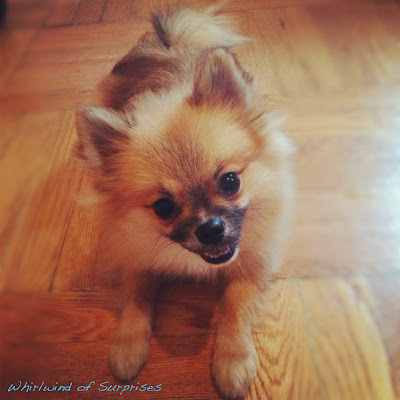 For example, New York apartments are small, so I prefer small dogs despite my childhood dream of wanting big dogs. Now I have two little guys, a Jack Russell and a Pomeranian. Believe me, both of them are atypical for their breed! My apartment doesn't have an enclosed outdoors area but my neighborhood is friendly and there are a couple of dog parks I can take them to. Those are definitely factors you want to consider when you have pets. However, you're not just choosing for you. The breed of the dog is important too. The very nature of the dog can affect their daily living and yours. Take for example, the Akita breed, they're adorable, big, loyal, and ever so fluffy. However, they are not suited for apartment or condo living unless they are properly socialized at a young age. Furthermore, they require early training due to their big and strong nature. They have the ability to hurt but with proper time, effort, and training, that can all be prevented. So, unless you have the time to train yourself or intend to take them to training classes, it wouldn't be a good idea to choose that breed. A good indoor dog may be a Pug since they're relatively inactive, do okay without a yard, and interact great with kids. When you have made your decision, then what? Adopt or Buy? That has to do with personal preference and I have done both. I, however, do prefer adoption when possible because there are so many great dogs out there without good homes. When you're ready to bring them home, Apartment Guide offers tips for bringing a new pet into your apartment and helping them adjust to your home. Come back next week for more tips about bringing your new dog home and your chance to win a $50 gift card. Stay connected with Apartment Guide for real-time tips and updates on how to make the most of your small space. They are both Adorable! It is so hard finding apartments that is suitable for pets. I just found a nice one for my daughter and her little doggie. Great post! It can be difficult to find housing when you have animals. Thanks for sharing this resource! My friend had a hard time finding an apartment that takes dogs. Using this guide would be so helpful. It's always tough finding apartments with pets! I think bad pet owners give us a bad rap when it comes to that! Great resource for this! Great tips! It's good to know that there are apartments willing to allow pets and it's good to know that there are tips like these out there to find the ones best suited for your pet. great tips I can't imagine moving anywhere that our little Allie couldn't come with us. great post! essential tips shared here, thanks for sharing! I am glad I own a home. I couldn't live without my furbabies! When walking your pet, make certain you have his/her attention at all times. Your lease is your guide. Use it wisely. So many pets need a good home - adoption is the way to go unless you are looking for a show animal or one to breed. There is no substitution for a well trained dog.